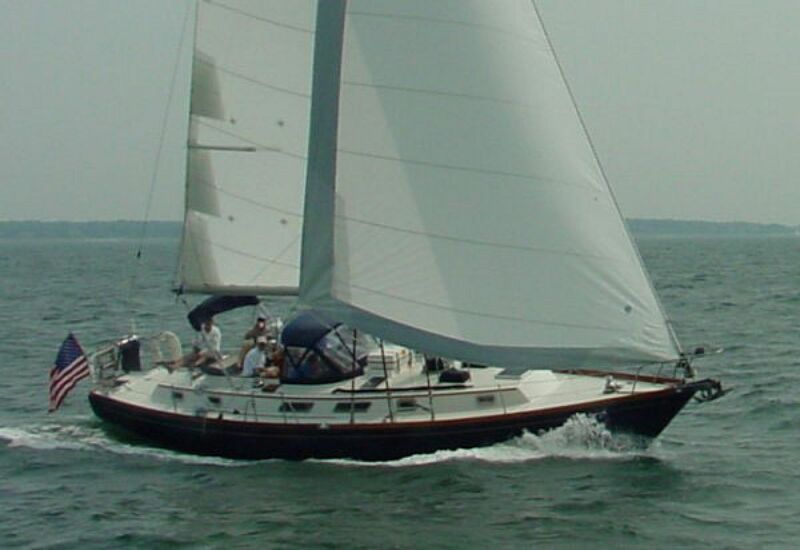 BLUE NOTE is a Special Bristol 43.3 CC owned by a knowledgeable Blue Water Sailor with all the equipment. New Yanmar engine, updated rigging, AC, fuel tanks replaced. She’s ready to go. 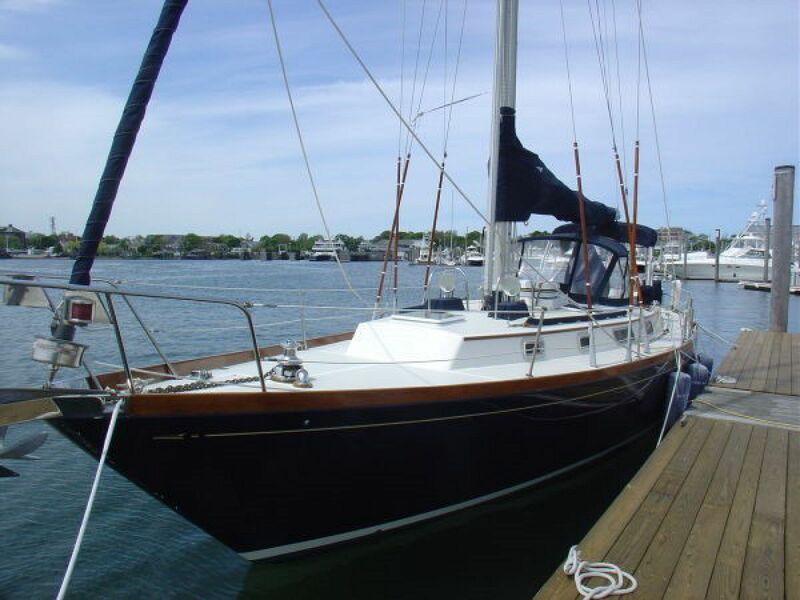 When looking at Blue Water Sailboats in this size and price range she stands above the rest, compare her for yourself. But don’t wait she won’t last long! BLUE NOTE is a traditional two cabin center cockpit with beautiful hand rubbed satin teak interior and varnished solid teak and holly sole. All doors and lockers are louvered for ventilation. 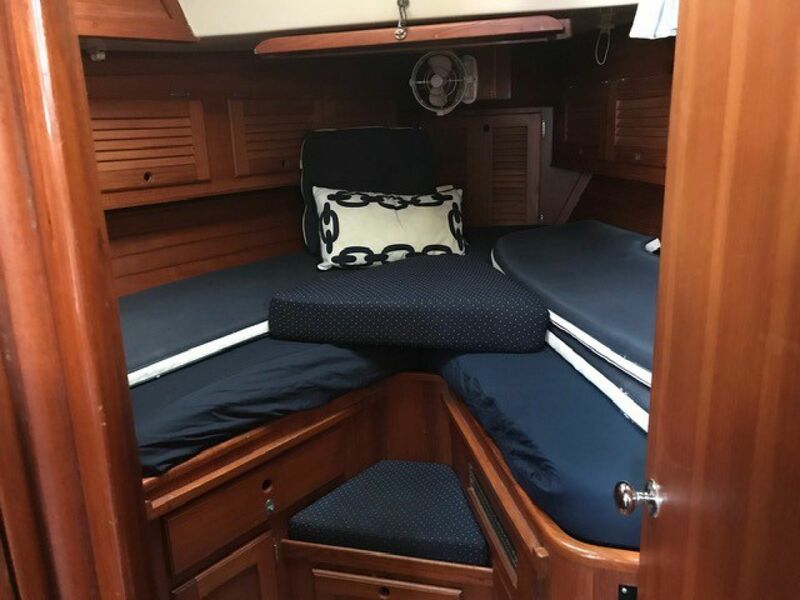 This two cabin layout provides privacy for two couples and provides additional sleeping accommodations for additional guests in the main salon. Starting forward this beautiful cabin has a V-berth with a seat and filler cushion. 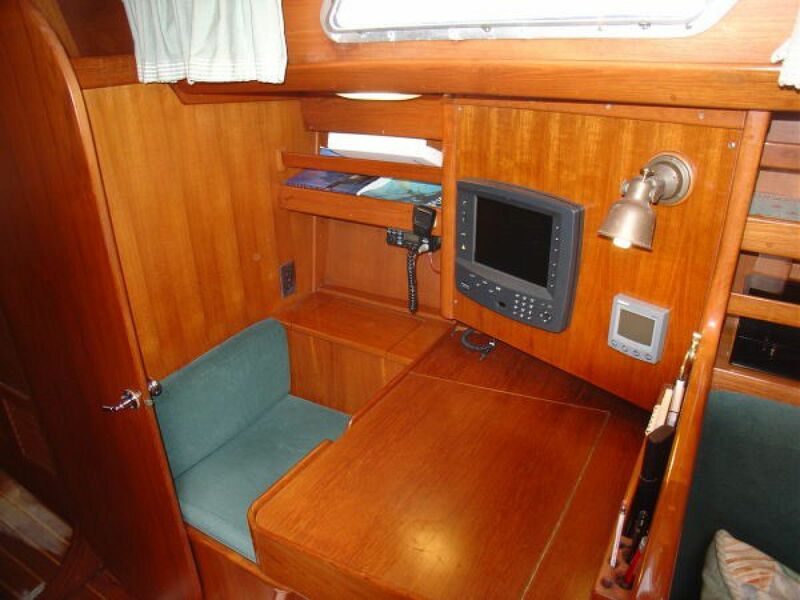 There is abundant storage outboard and in hanging lockers. Access to the forward head is available from the forward cabin and a second entrance from the salon passageway. 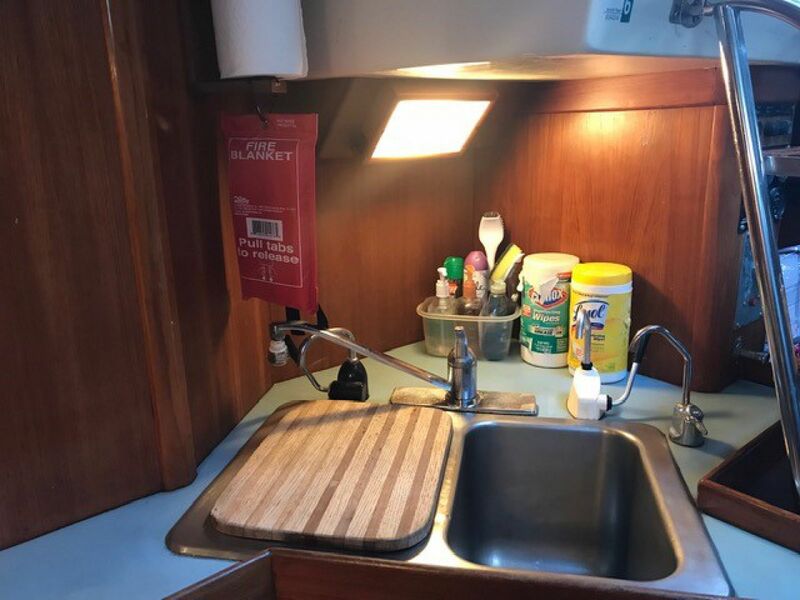 The overhead hatch and port lights provide good ventilation and natural light into the cabin. 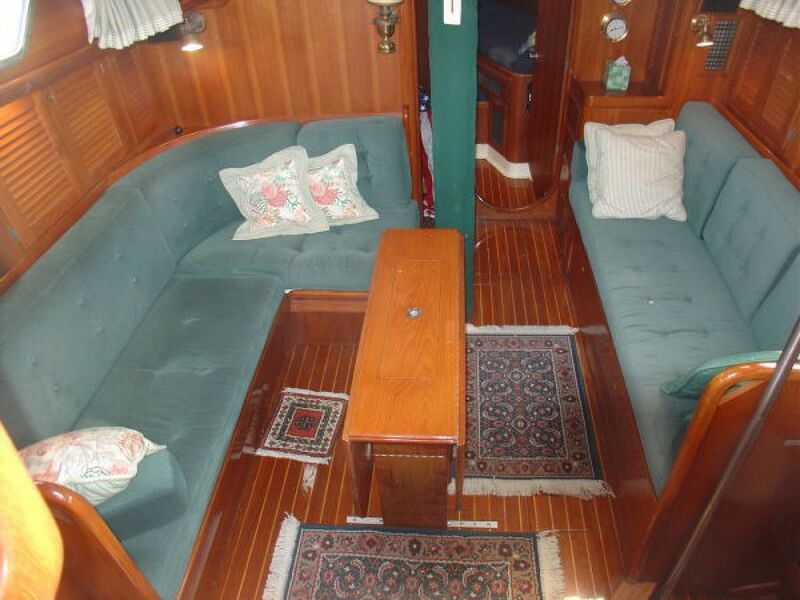 The main salon has a full length settee to starboard that pulls out to form a double berth. 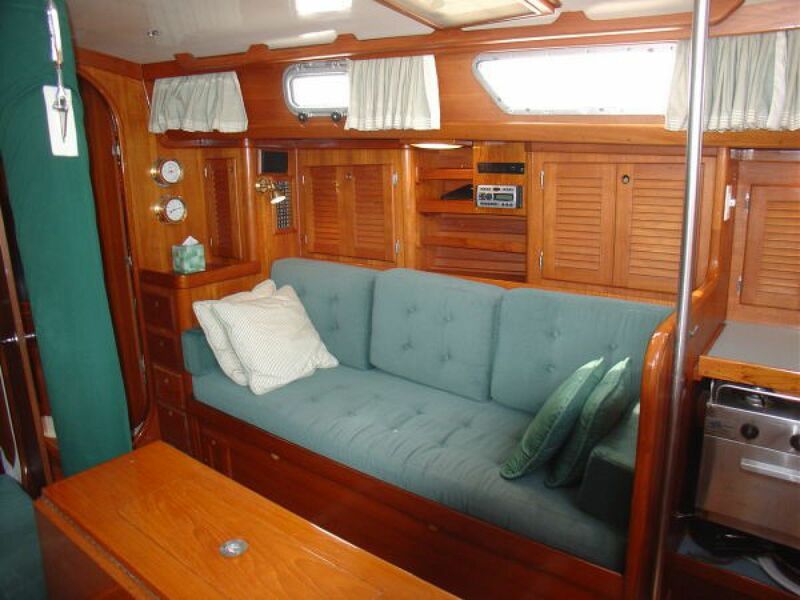 An L-shaped settee to port extends to a double berth when needed for extra guests. There is a drop leaf table just off center with utensil/bottle storage in the middle. 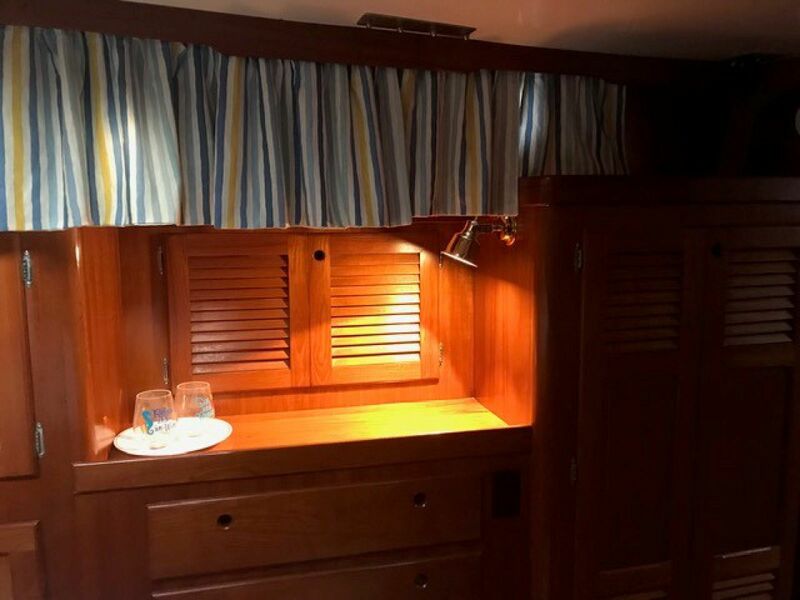 There are louvered door storage compartments above and outboard as well as enclosed storage behind the settee seat backs, port and starboard. The forward facing navigation station is to port. It has a large chart table with storage under and flush mounted electronics. Large access doors to the engine and generator are inboard, opposite the nav station with additional access panels to the engine room on all sides. 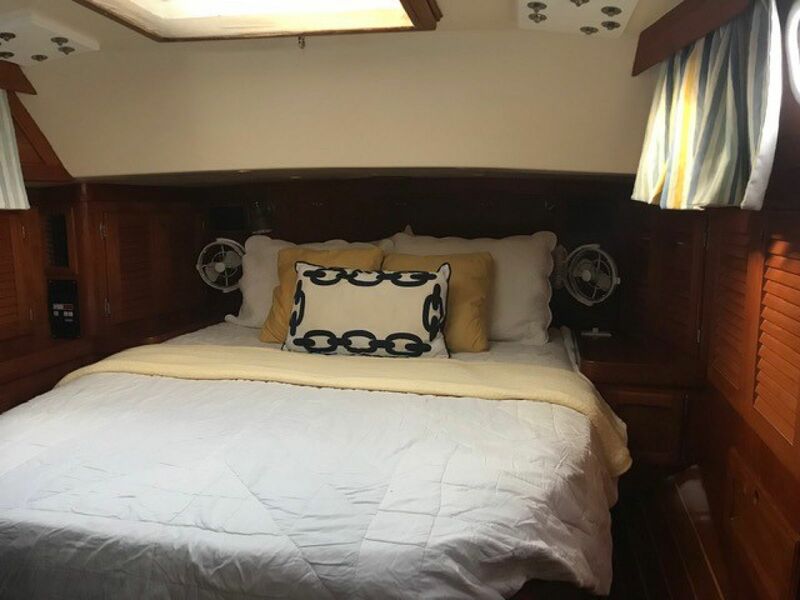 The aft stateroom has a centerline queen berth with an abundance of storage compartments on both sides. A large hanging locker is to port. 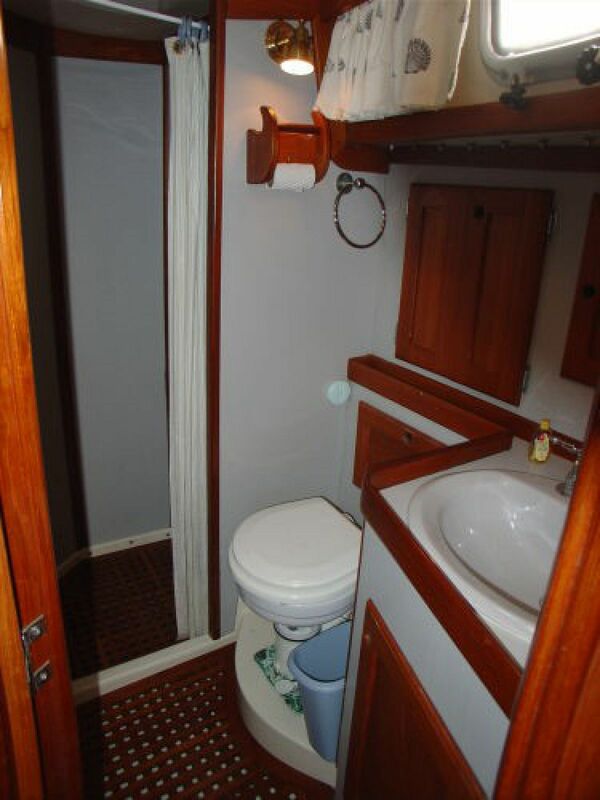 The aft head is to starboard with a separate shower stall and electric head (2016). 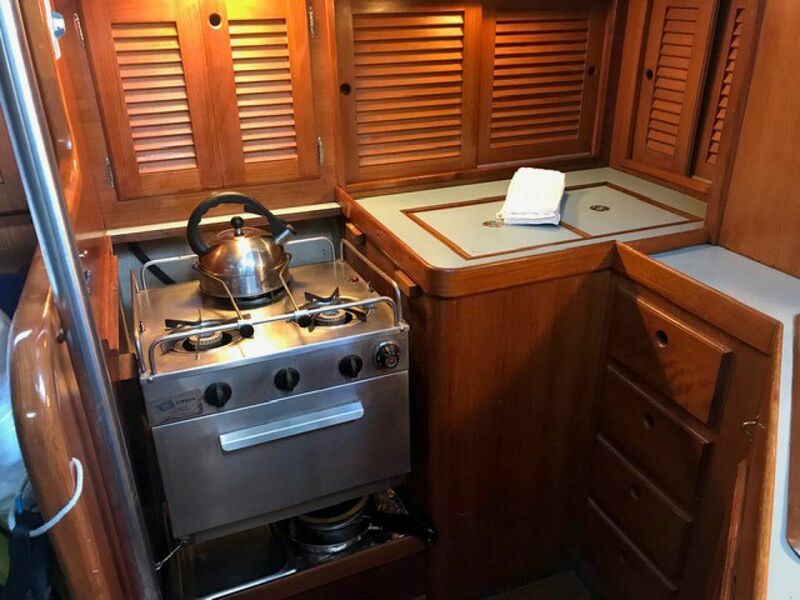 The U-shaped galley is aft to starboard, conveniently located next to the companionway. 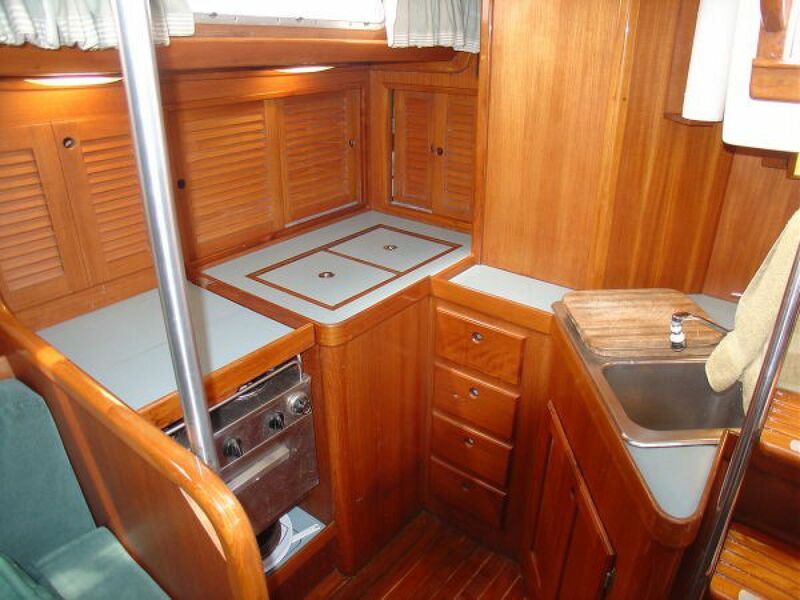 There is extensive counter space and abundant storage throughout. Awlgrip flag blue hull with gold cove, white boot stripe, VC Offshore Red bottom, and white cabin trunk with green non-skid molded in. 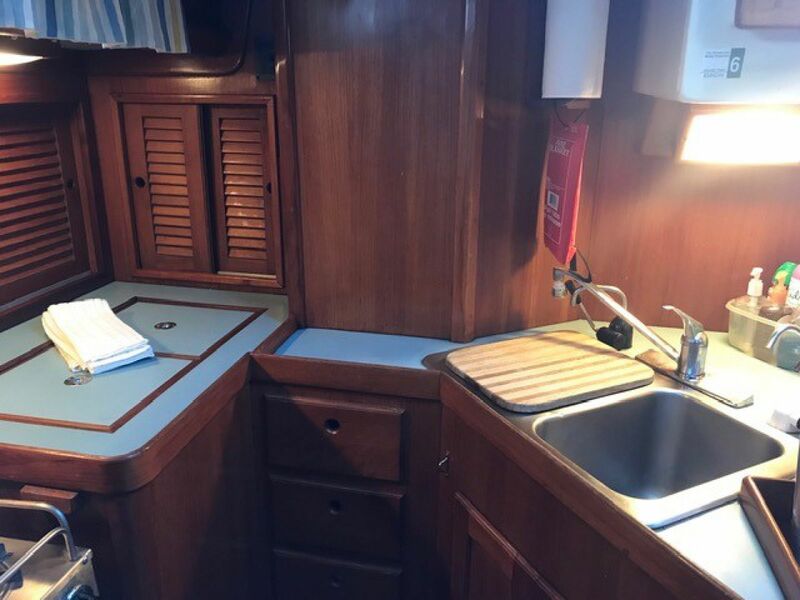 BLUE NOTE offers many nice features rarely found on a yacht of this size, including two private staterooms and ensuite heads, with centerline queen berth aft. 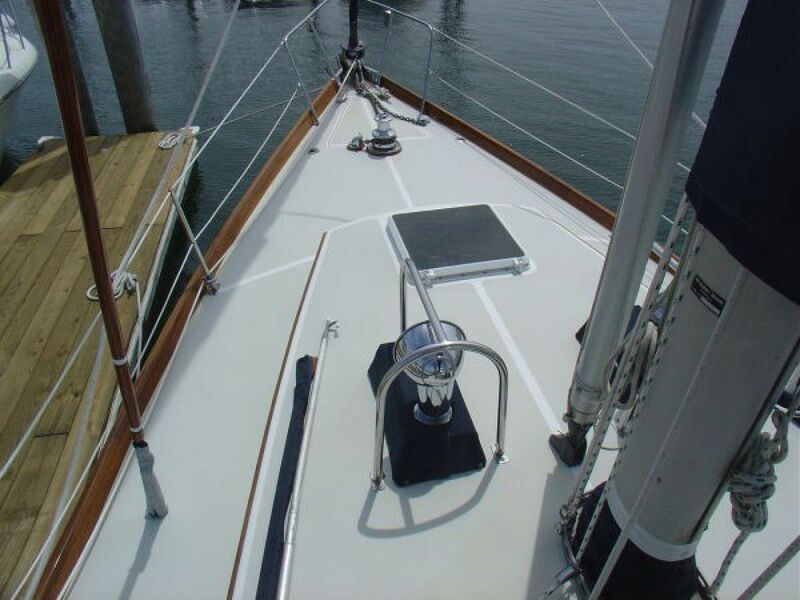 She is well equipped for extended cruising and is able to go almost anywhere with her 4'6" draft. 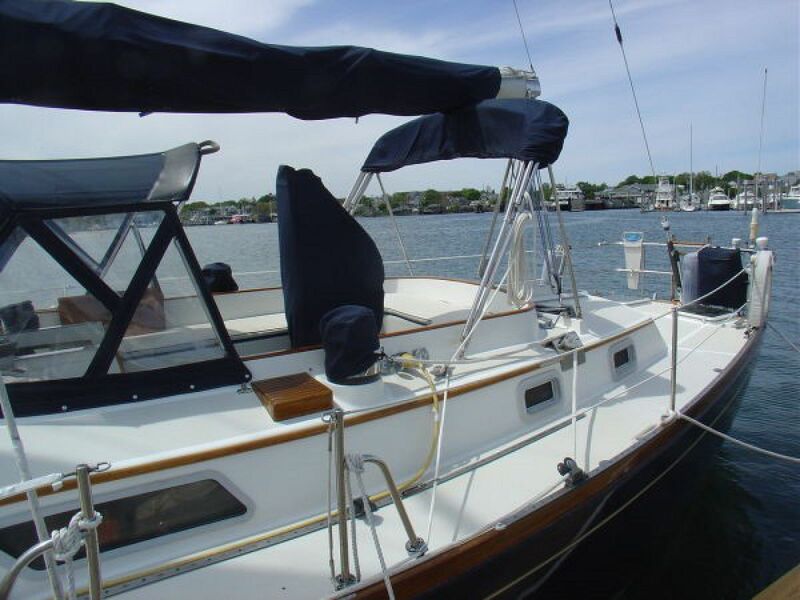 Since nearly new, BLUE NOTE has been professional cared for and given meticulous attention by her current owner which will be evident upon inspection. This popular Hood-designed yacht will satisfy her new owner for years to come! 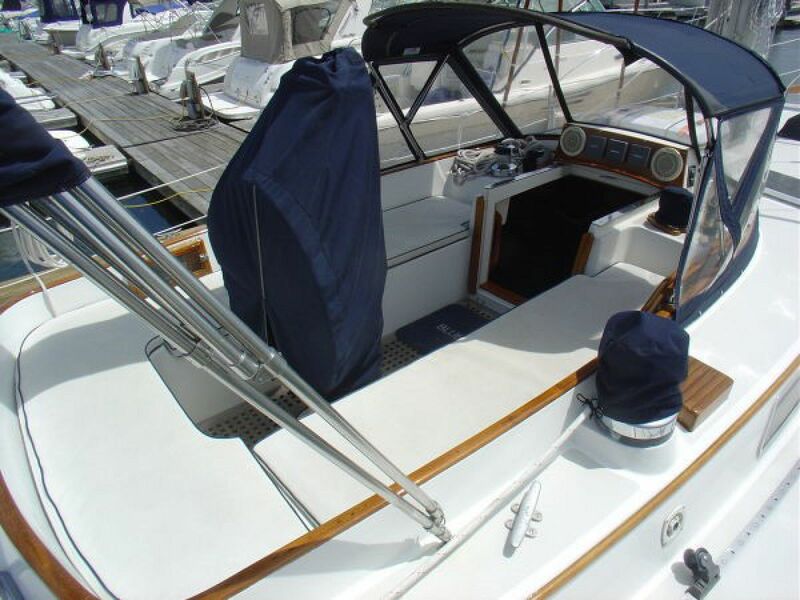 Blue Note is a special boat for anyone looking for a ready to go cruising vessel. 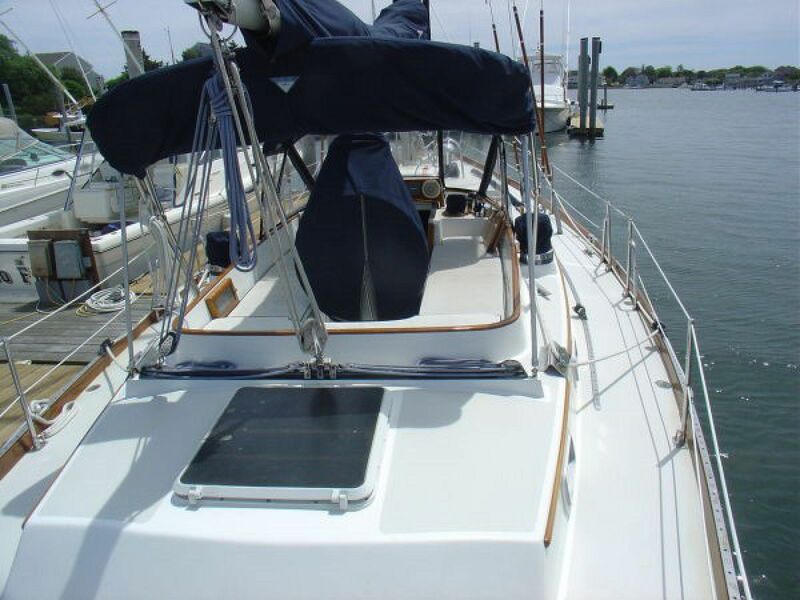 She’s been sailed by a knowledgeable owner who has done extensive ocean sailing and has systems to facilitate this type of sailing. All of the heavy lifting has been done on BLUE NOTE: New fuel tanks, new topside paint, sails, and almost every piece of equipment necessary to go cruising comfortably for extended periods. 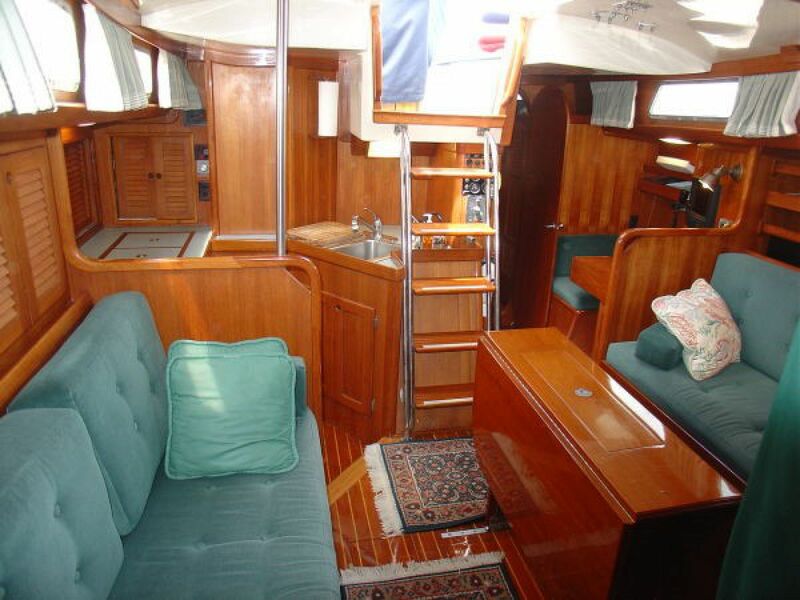 She’s a must see for anyone looking at a cruising boat in this price category.